So you fancy yourself a guitar player? We wish we could play the guitar. So far, based on a quick survey in the break room, we only have a few very skilled air guitarists. No one who actually knows how to play the instrument. Which is a shame, because we wanted to start a company band. But there's no musical guitar skills here. But you? Maybe you have guitar skills. Some crazy, electric guitar skills that send people into ecstatic fits to hear you play. Maybe you're so smooth glass gets jealous. So skilled that guitars wince when you pick them up. Maybe you're like a rock 'n roll god, and you just don't know it yet. Maybe you're the next Jimi Hendrix. And if you are the next Jimi Hendrix, then you better look the part. For instance, you could try a crazy riff while wearing this Jimi Hendrix Adult Hat. 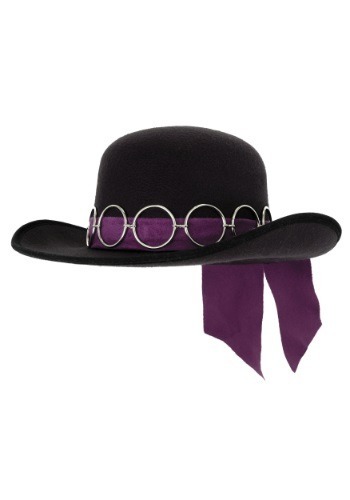 It's faux suede with a silver chain and purple fabric around the crown. Put this on and, even if you're not quite as good as Hendrix, you'll at least look like a rockstar.